Oh, Ubud. You surprised us with your delectable foodie scene. 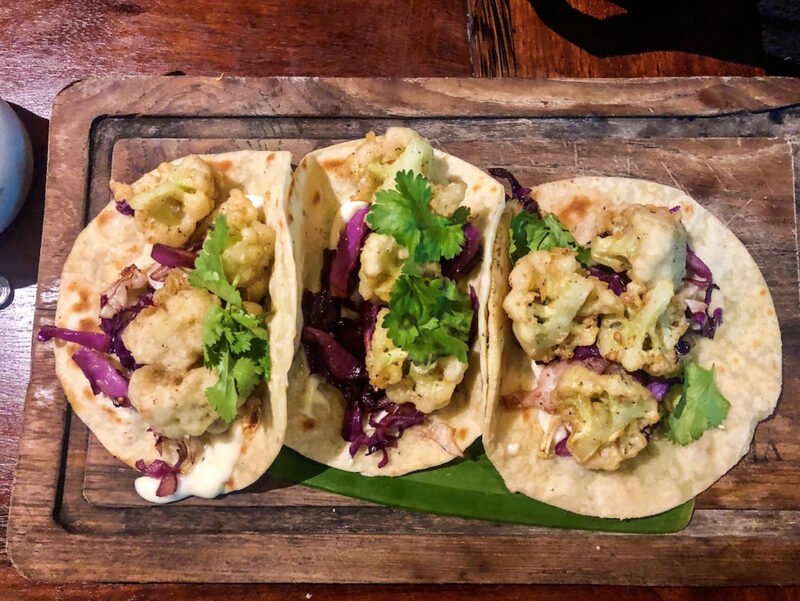 We fell in love with your cauliflower tacos and bowls of Thai noodles on the cheap, swooned over your two- for-one ginger mojitos, and raved about the affordable plates of spare ribs at Naughty Nuri’s that Anthony Bourdain put on the map. You made us a believer in Bali’s best food finds that we won’t soon forget. Take a peek at the seven Ubud food spots that topped our FAB list! 1. 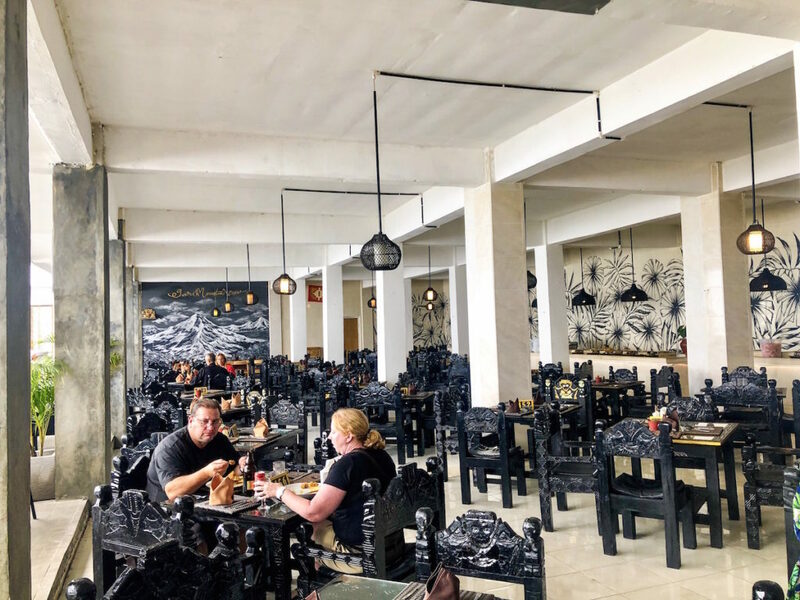 Cinta Grill & Inn: The food at this restaurant was so good that it was tough not to eat there every day that we were in Ubud. The affordable menu is extensive, with breakfast, lunch and dinner all on deck, but our faves (and the faves of other diners alike) reign supreme. Don’t miss the bacon burger, fish tacos, chicken wings, and grilled cauliflower tacos for lunch or dinner, and the ginger and watermelon mojitos at the late night happy hour, where mojitos are two for one. We were so hungry the first night we ate dinner there that we spent 1 million rupiahs (about $67 USD) altogether for several plates of food and cocktails. Still, only about $23 for everything we ordered felt like a steal. 2. Naughty Nuri’s: This grilled meat paradise is one you simply can’t miss when you’re in town. 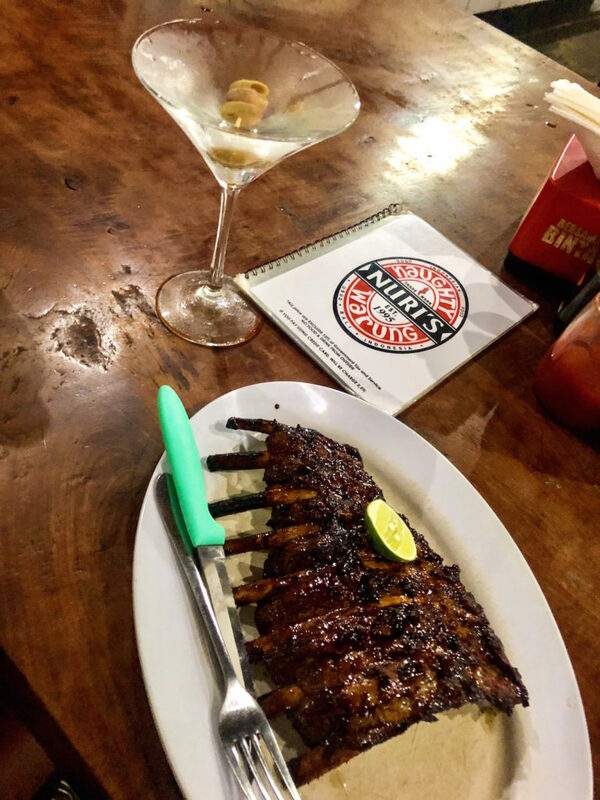 Anthony Bourdain put it on the map after he raved about the spare pork ribs and dirty martinis, and after one taste of both we were sold too. The ribs are crispy in the right places, flavorful, and there is a selection of tasty barbecue sauces on each table. The dishes are served a la carte, so order a plate of fries to turn any of the meat plates into a meal. Then, take things to the next level with their famed dirty martini. We’re not even into dirty martinis, and we’ll still tell you that this one is a must. They fill up the glass until it overflows, and it’s beyond strong. You only need one. 3. Laughing Buddha: When you’re looking for late night bites, good custom drinks and live music, head here. This low lit cocktail den is one of the top places in town to hang out at night. Grab a seat and don’t miss the crispy fried shrimp wontons, spicy thai fried chicken wings, and patatas bravas while you’re taking in the live band with one of their signature mojitos. Speaking of mojitos (and cocktails in general), Laughing Buddha has a happy hour from 4-7, where certain cocktails are buy one, get one free. 4. Melting Wok: This open air hidden find is so intimate that it only has eight tables, so it’s easy to walk right past it. The asian/french fusion grub brings Ubud visitors to the restaurant in droves, so it’s best to book it early. The menu is written on chalkboards, which are carried to tables, and usually has a mix of crepes, curries and noodle dishes. 5. Birdnest in Kupu Kupu Barong: If you’re looking for unparalleled ambiance, it’s tough to find better than the vibe at Kupu Kupu Barong. Why? You can actually dine outdoors inside of a giant, elevated bird’s nest. So, while you’re taking in views of Ayung River Valley with your boo or a group of friends, you can toast cocktails and feast on pan seared snapper or chargrilled steak with candle light flickering in the background. As a bonus, you can also dine on a five-course menu on a raised plane in the middle of an infinity pool. The cheapest way to do either one is to grab breakfast instead of dinner, when prices start at $40 USD per person. Dinner starts at about $80 USD. 6. 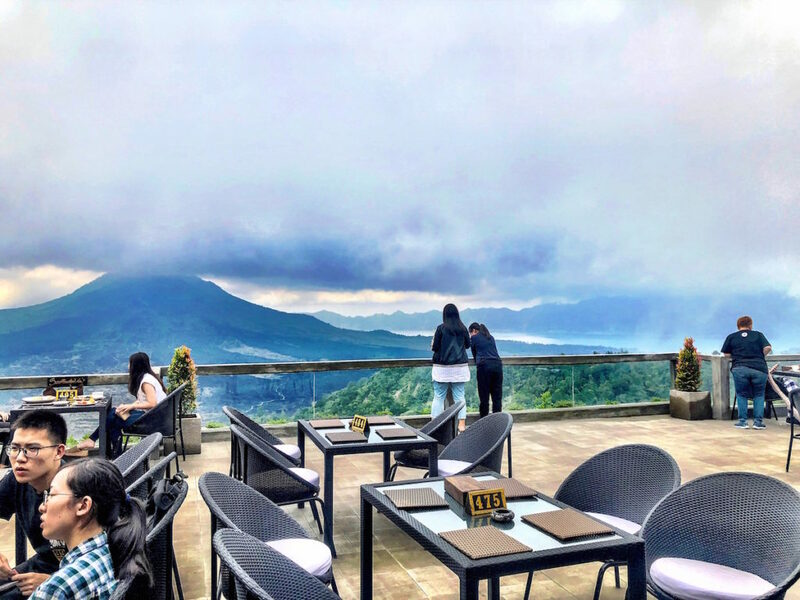 Sari Mountain View Restaurant, Bar and Coffee: A pick me up with volcano views? Sign us up. 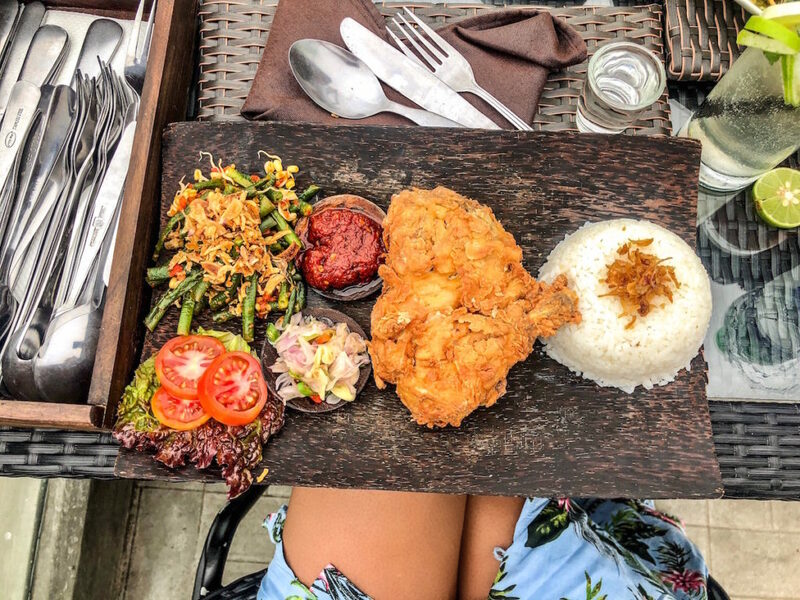 When you’re in Ubud, try not to miss grabbing a meal without Mount Batur in the background. We didn’t swoon over the food here, but we did love the spacious outdoor patio, which had panoramic views of the volcano. Enjoy cups of coffee and lattes here, and get your foodie fix elsewhere. If you’re starving though, skip the buffet and nosh on a plate of fried chicken and rice. 7. Dumbo : If you’re on the hunt for vegetarian restaurants in Ubud, they’re not hard to find. But when it comes to one of the best, look no further than this wood-fired Italian hot spot that tops ‘Best of’ Ubud restaurant lists over and over again. Guests rave about the tempura zucchini flowers here as well as the variety of wood-fire pizzas topped with everything from roasted tomatoes to capers, roasted paprika, olives, and spicy tomato sambal.